Perhaps one of the greatest glories of our little church is its association with St. John Kemble, who was martyred at Hereford in 1679 and who lies buried at Welsh Newton, four miles north of the town. 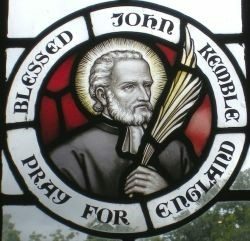 John Kemble was born in 1599 at Rhydicar Farm, St. Weonards, near Monmouth. Both his parents were Catholics and as a boy he was used to priests being welcome there and to the celebration of Holy Mass in the household. He entered the English College at Douai in about 1620 and was ordained a priest on 23rd February 1625. Three months later, he returned to his native country as a missionary priest, where he ministered to local Catholics for the next 54 years. In 1630 his brother George leased Pembridge Castle, also near Monmouth, where John Kemble made his home at a time of great civil and political anxiety. In 1678, the infamous Popish Plot falsely accused English Catholics, especially priests, of attempting to assassinate Charles II and replace him with his brother, the Catholic James, Duke of York. All over the country, Catholics were thrown into prison and priests condemned to death and mutilation for those found guilty of treason. Pilgrimage to the grave from St. Mary’s, Monmouth, is thought to have begun soon after the martyr’s death and to have continued every year since. The parish exercises the privilege of organising the pilgrimage every August, on the Sunday nearest to his feast day, 22nd August. Recent pilgrimages have traditionally ended with benediction and refreshments in St. Mary’s, Monmouth. The Pilgrimage Secretary is Mrs. Mary Walsh. Here at St. Mary’s, Monmouth are preserved relics of the Saint, together with his chalice, missal, portable altar-stone, and carved oak table on which he celebrated Mass at Pembridge Castle, His “Monmouth Missal” dated 1816 and inscribed in his own hand, was restored in 2011 and was displayed on the occasion of benediction following the annual pilgrimage in 2013 and on successive pilgrimages. A receipt survives for the chalice, patens and vestments loaned by Rev. Thomas Burgess to the Catholic Missionary of Cardiff, 1837, and a letter to Rev. Thomas Abbot from John (later Cardinal) Newman with condolences at the death of a Mr. Marshall in 1875.